It’s been quite a long time since a girls singles tennis player from the Santa Clarita Valley reached the semifinals of the CIF-Southern Section Girls Individual Tennis Championships. That period has come to an end, as Golden Valley’s Justine Dondonay advanced to the semifinals after winning two matches on Wednesday at the Seal Beach Tennis Center in Orange County. After receiving a bye in the Round of 32, Dondonay defeated Sophie McKenzie of La Canada 6-1, 6-4 to advance to the quarterfinals. “She’s getting better with each match,” said Golden Valley head coach Josh Stimac. “It was such good tennis today. She was banging the ball pretty hard. It was just awesome to watch.” In the quarterfinals, Dondonay faced off against 14-year-old freshman Jane Lee of University High School, beating her 6-3, 6-2 to reach the final four. Up next is a rematch against Casie Wooten of Chadwick School, who eliminated Dondonay in the quarterfinals last year. “When you get to the semis, every player is a blue-chip Division 1 prospect,” Stimac said. 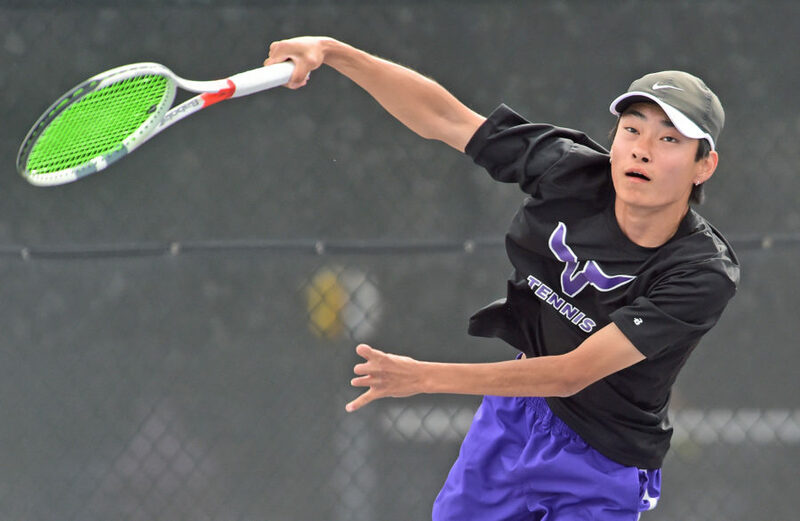 “It’s going to be a tough match against Wooten.” While Dondonay impressed all year in the Foothill League, Golden Valley finished in fifth place as a team in the league. Nonetheless, the Grizzlies remain the last Foothill team standing in the playoffs behind stellar play from Dondonay all season. “If you would have told me that Golden Valley would have the longest tennis season for girls, I would have called you a liar,” Stimac said. “This is uncharted territory for us as a school and Santa Clarita for quite some time.” The semifinals, originally slated for Thursday, were pushed back to Friday, Nov. 30 due to a high probability of rain. The matches will start at 11 a.m. at the Seal Beach Tennis Center. The championship match will take place immediately after the conclusion of the semifinals. After dropping only four games in their first three matches of the CIF-SS Playoffs, Vikings duo Amanda Tabanera and Brenna Whelan were eliminated in the Round of 16 after losing to Jordan Hickey and Arianna Stavropoulos of Marlborough 6-3, 6-4. Tabanera and Whelan had received a bye in the Round of 32. “The Valencia girls played tough today, but lost to a really solid doubles team,” Stimac said. Tammy Cecchini, the head coach of the women’s tennis team at Valparaiso University in Indiana, flew out to watch Tabanera play. Tabanera signed her letter of intent to play at Valpo earlier this month.